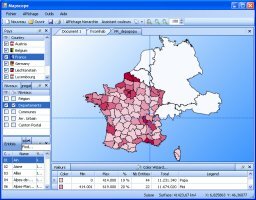 MapScope allows to import your data or to enter them manually in order to display them on a Map. MapScope allows to define many gradient color or color palette according to different users' values range. You can save and load your own palettes. The geographical areas will automaticaly be set in colour depending on the palette used and the value set for the area.